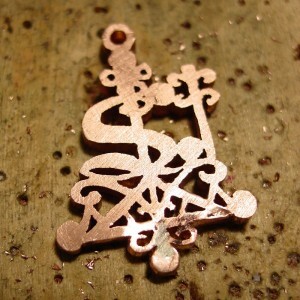 Veve: A Veve is a religious symbol commonly used in Haitian Vodou. 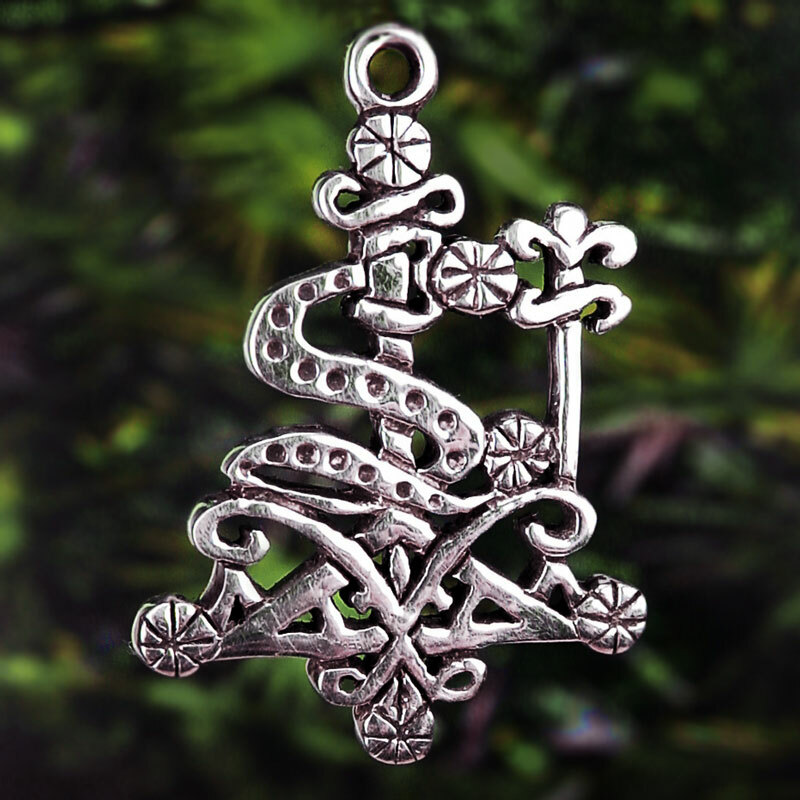 It acts as a beacon for the Loa spirit, and serves as a Loa’s representation during rituals. In the past, it was believed that the veve was derived from the beliefs of the native Taíno people, but more recent scholarship has demonstrated a close link between the veve and the cosmogram of the Kongo people. 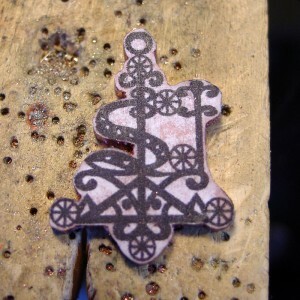 Veve symbols may also have originated as the Nsibidi system of writing for the Igboid and Ekoid languages. It was transported to Haiti through the Atlantic slave trade and then evolved into the Veve. 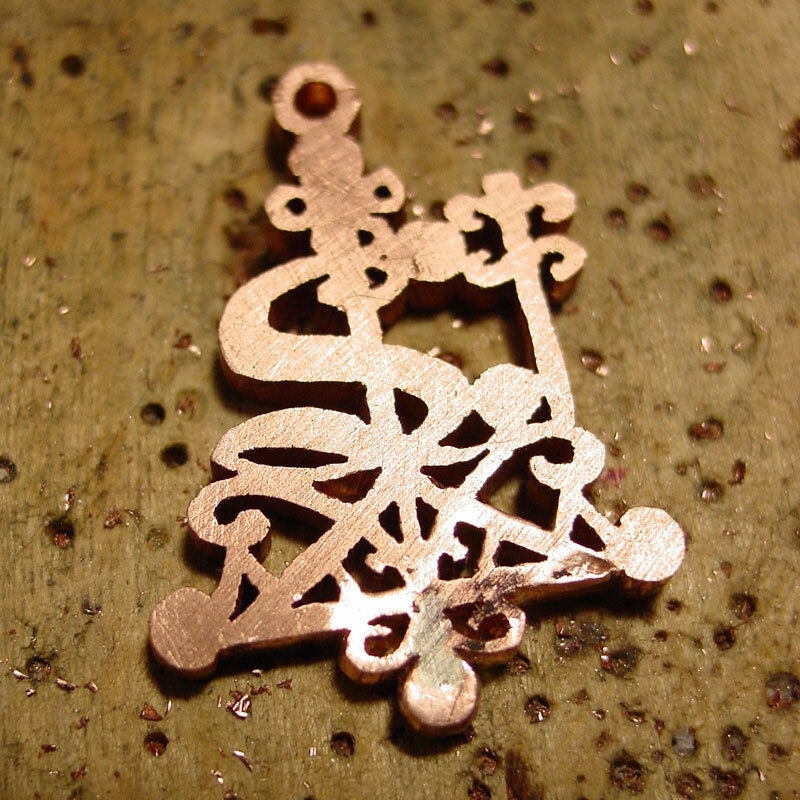 Every Loa has his or her own unique veve, although regional differences have led to different veves for the same loa in some cases. Sacrifices and offerings are usually placed upon them, with food and drink being most commonly used in the West. 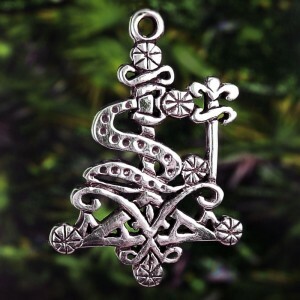 In ritual and other formalities, veve is usually drawn on the floor by strewing a powder-like substance, commonly cornmeal, wheat flour, bark, red brick powder, or gunpowder, though the material depends entirely upon the ritual. In Haitian Vodou, a mixture of cornmeal and wood ash is used. Here is a photo journal detailing the steps involved in creating a copper master of a vodou veve. 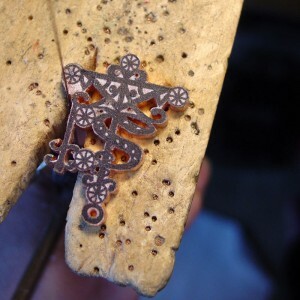 When creating a master model for casting, many artisans prefer to work with special jewelers’ wax to create their model because it is much easier to work with than metal. 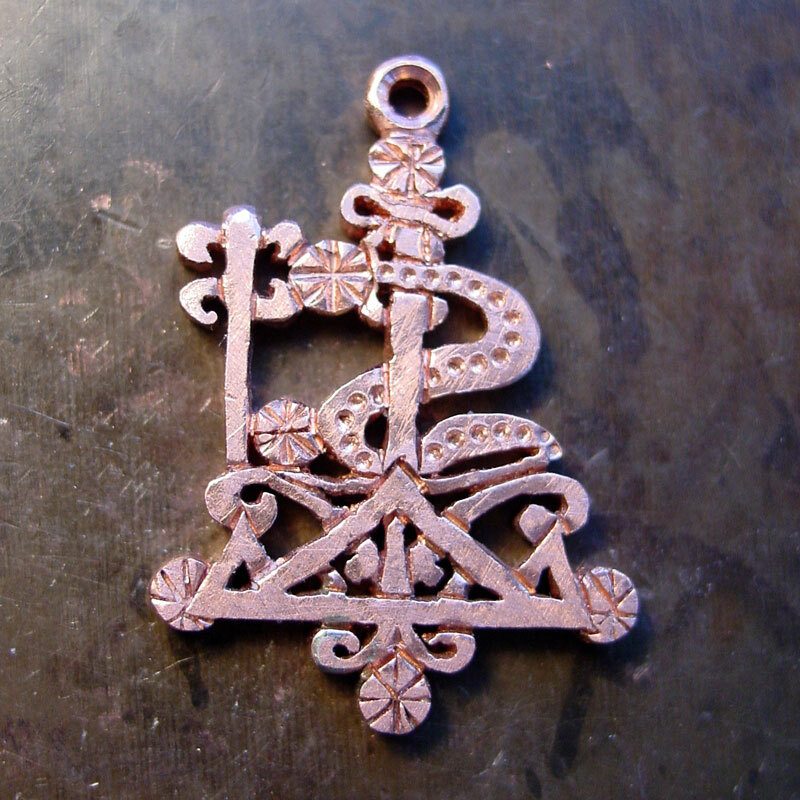 While I can successfully create master models in wax, I prefer to create the veve masters in copper; working with metal for me is much more familiar and comfortable than working with wax and, in the end, I have the original model that will not warp or disintegrate over time. 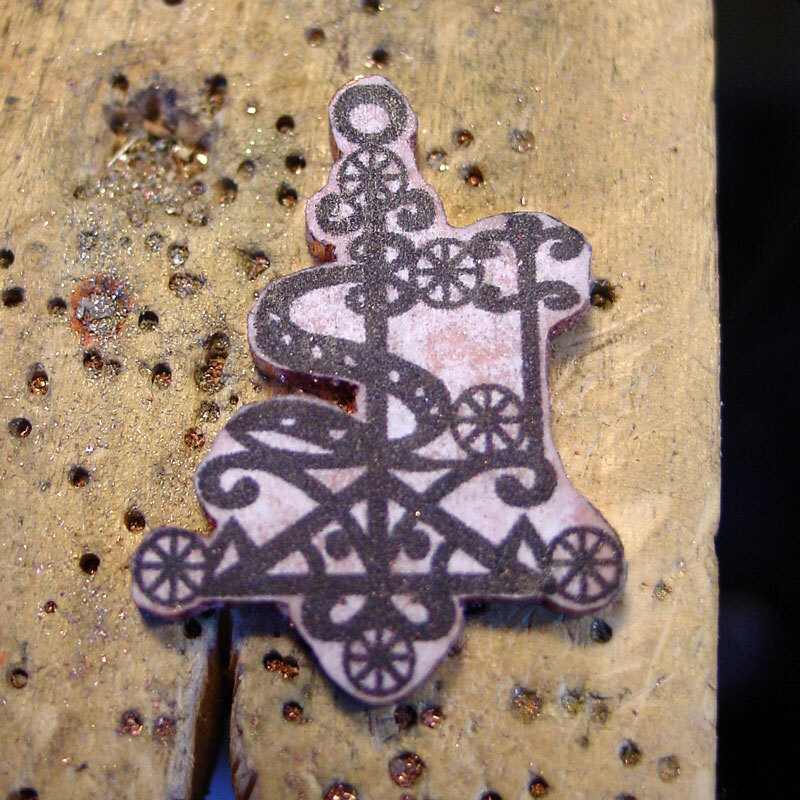 This is Loco, a new veve that I am creating as the next charm in a series of sacred symbols of the Vodou faith. 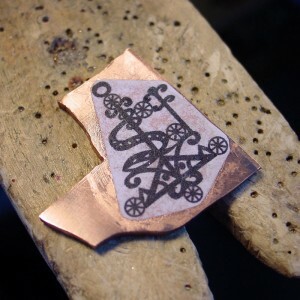 Typically, someone will request that I create a veve for them and this is how the next charm comes into being. Often they will send a picture, such as the one above. I then research the symbol to learn more about the various aspects of the lines and how it corresponds with the deity it stands for, and then begin to draw the design out as to how it will be cut into metal form. 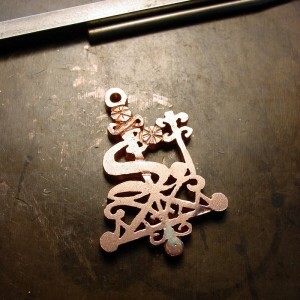 There are several factors I consider when designing the veve for a metal rendition, most importantly, how to retain the original vision and design of the veve while configuring it to become a suitable piece of wearable jewelry. Primarily, the design needs to be constructed in a way that will keep all the individual parts of the design strong, no hooks that will catch on clothing or be sharp to touch, or be prone to repeated bending or breaking. The physical demands of the casting process are also considered; making sure that the model is constructed in such a way that there will be no obstruction to the flow of molten metal during the casting itself, with no undercuts in the model that would make creating a mould of it difficult. 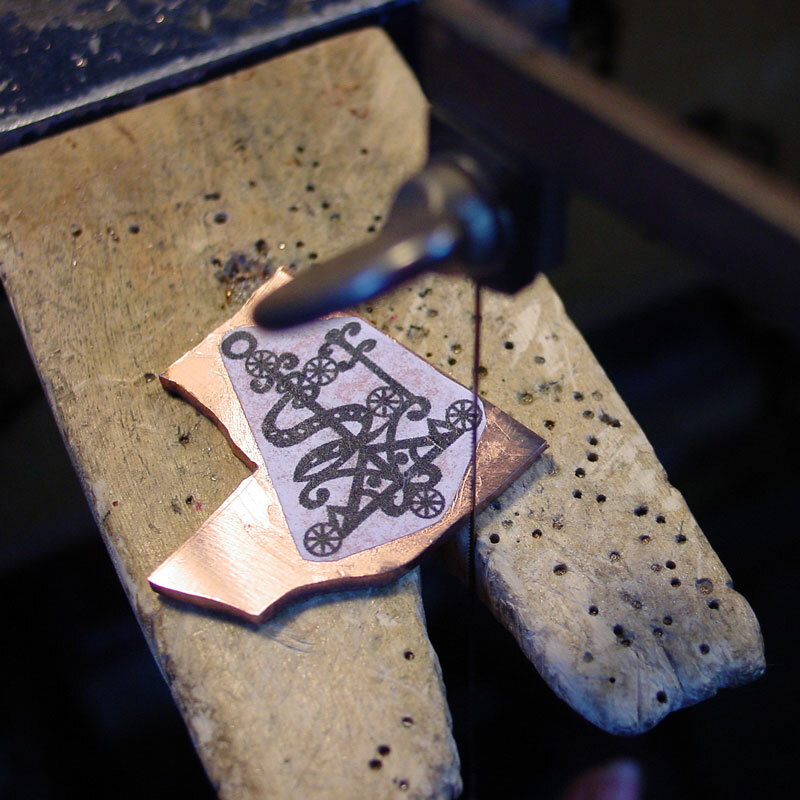 Once the veve design has been rendered into a workable jewelry form and the appropriate size determined, the drawing is then glued onto the copper. 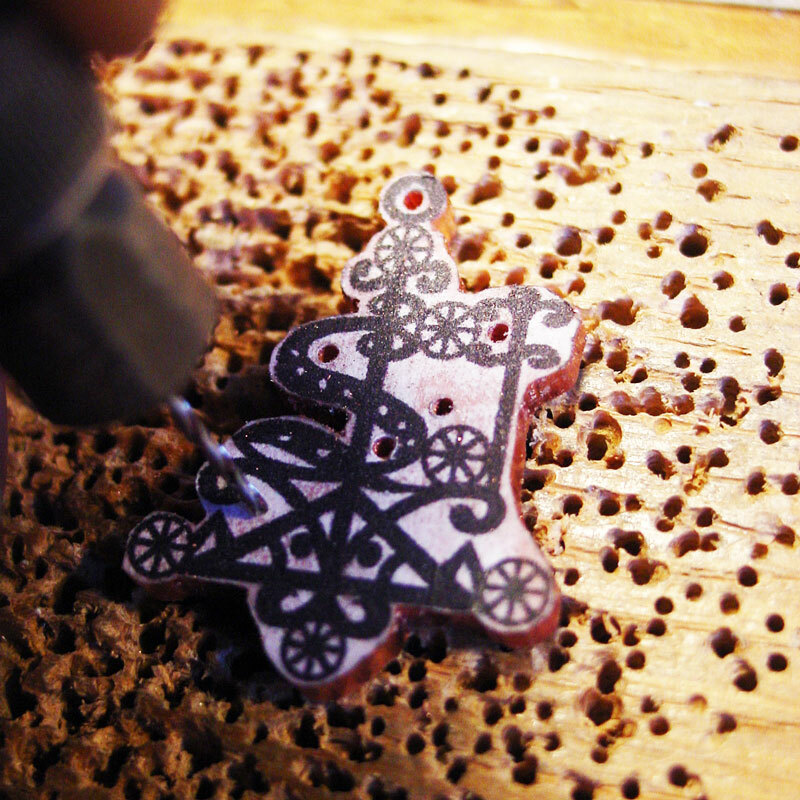 Once the basic design has been cut out, I drilled holes through the inner areas of the piece to be cut out. Some of the inner areas to be drilled are so tiny that I had to use a #75 drill bit ( 0.53mm or .0210″) . 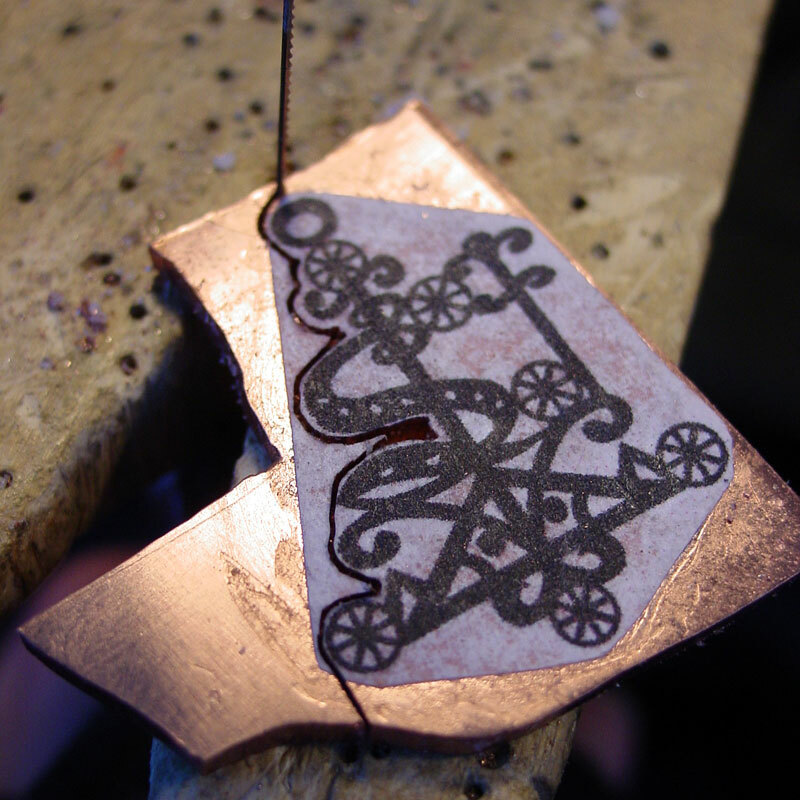 Some of these areas are so precise, and the drill bits so delicate, I ended up breaking off several bits (about 12) in the copper that I later had to dig out. I can tell you that in producing the Ogoun veve master I broke 30 tiny drill bits and at least 25 tiny saw blades to complete that piece. Because they are so very small and the metal is very thick, they require such a feather-light touch it is impossible not to break a few. That was about the easiest phase of creating the master. 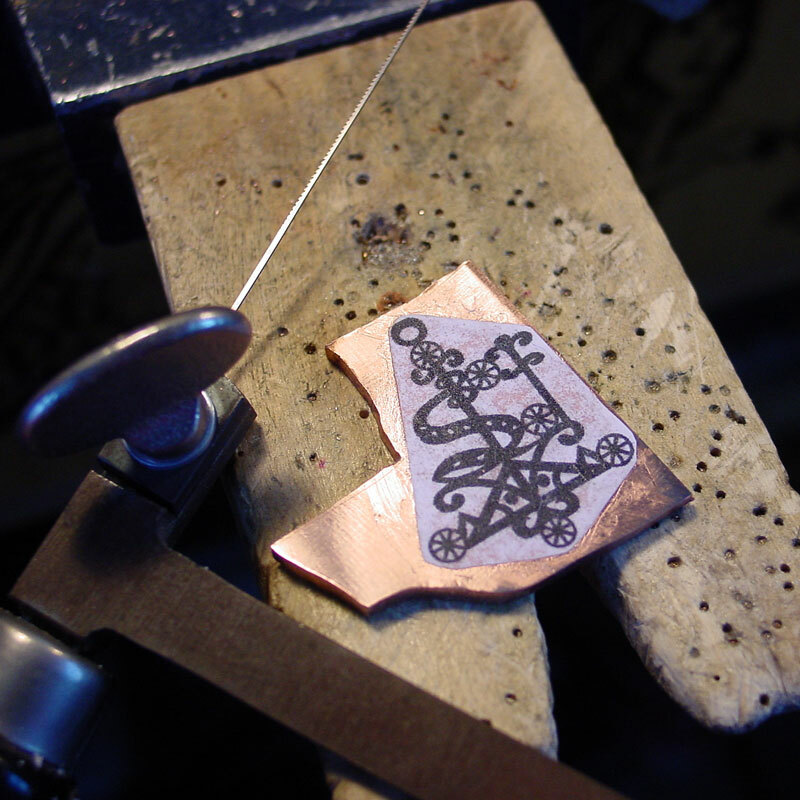 After the piece has been cut out around the outer and inner contours, which is very time-consuming in and of itself, the detailing refinement begins. Painstaking hours of filing with a small jeweler’s file to clean up the shape, get rid saw tooth marks, and level the back cut marks to match the front cuts. 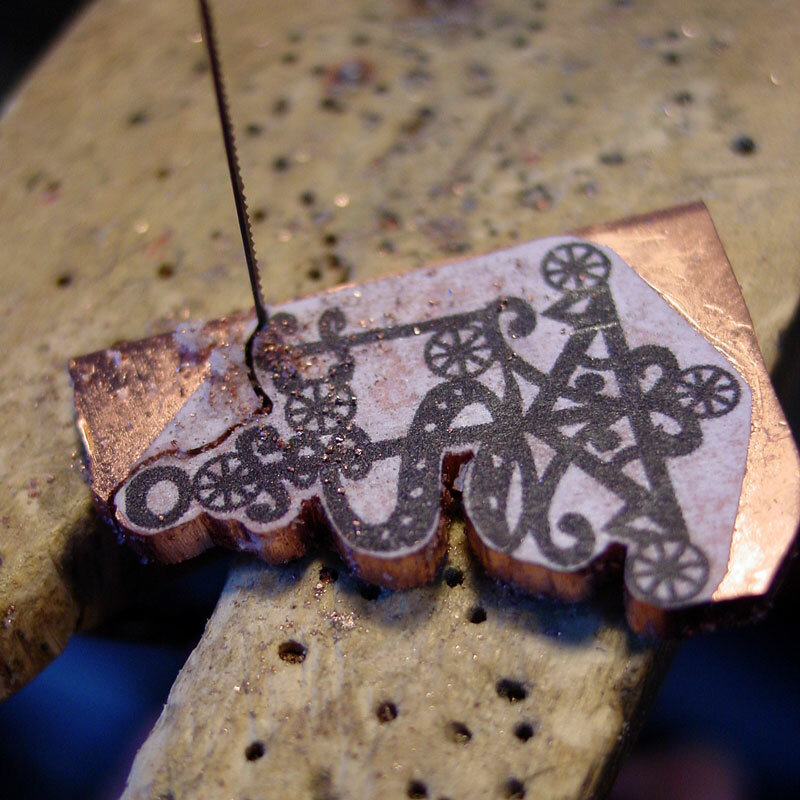 Once the overall shape has been smoothed and refined, I add the design detail using traditional stamping tools, as well as small screw drivers and broken drill bits that I have filed and modified into stamping tools. 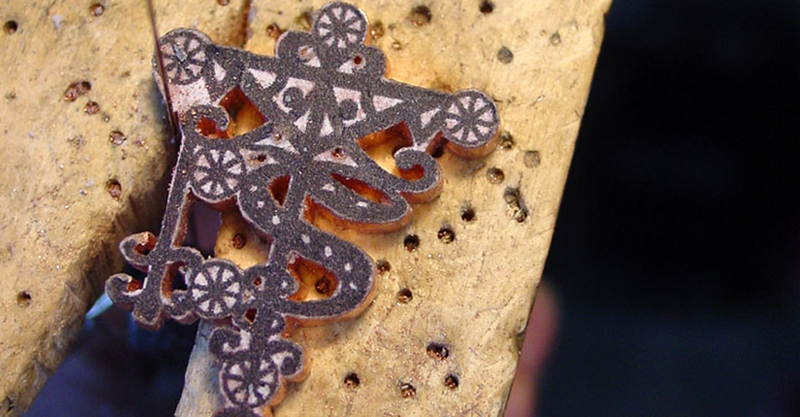 Each line and dot has been meticulously hammered into the piece, making sure it is deep enough to endure the casting process and final mechanical buff finishing to its final polish. I take care to mark the front and back of the design differently so as to imply a three-dimensional aspect to the design. This highlights the different symbols of the veve depending on which side you look at. 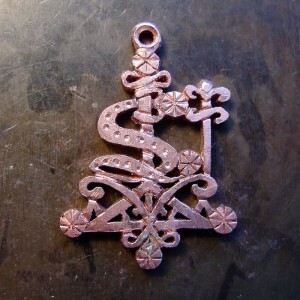 Now the copper master is ready to be sent to the casters to make a rubber mould of it. This is the mould they will keep on site and use to create cast copies in sterling silver and other metals. 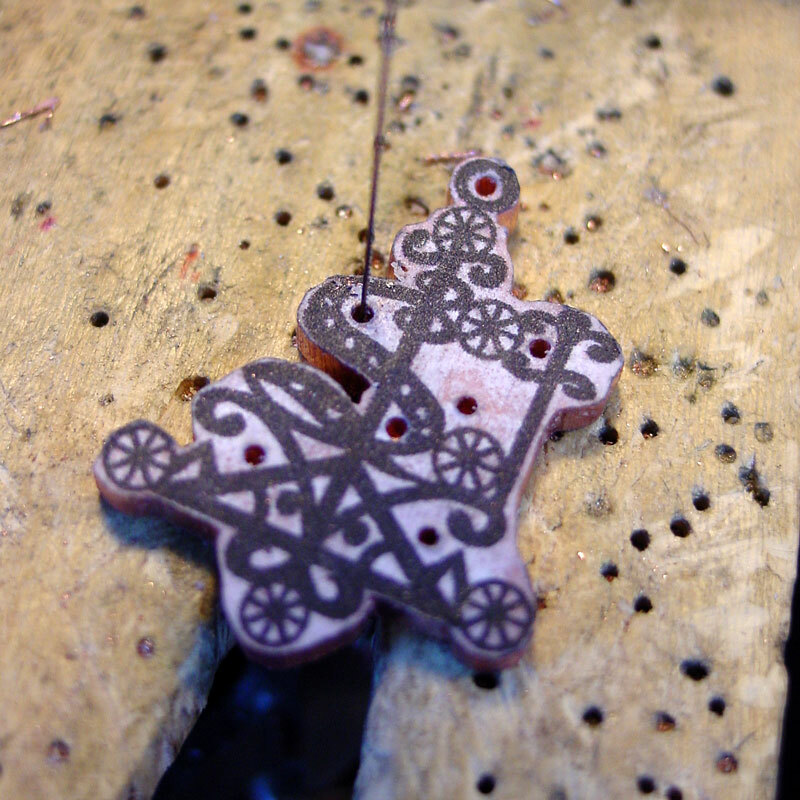 While there is a much easier and more technically precise procedure to create a master model called CAD/CAM (computer-aided design/computer-aided manufacturing), the principle behind my bare-bones, old-school manual technique in creating these veve charms is that, because these symbols were originally primitively drawn on the ground as reverent symbols of Haitian deities, I believe they should continue to retain the look and feel of and, indeed, be reproduced in the same organic manner with which they were originally manifested, with just as much conscious thought, energy, and artistic creativity with which they were originally drawn. Next post: As Seen On TV! This was fascinating to read – thank you for posting it. 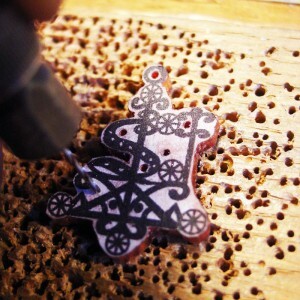 I’m even more interesting in getting the charms now that I know how they’re made! Beautiful and with your usual high quality.